Simmons, B.I.,Sutherland, W.J., Dicks, L.V., Albrecht, J., Farwig, N., García, D., Jordano, P., González‐Varo, J.P. (2018): Moving from frugivory to seed dispersal: incorporating the functional outcomes of interactions in plant‐frugivore networks. J Anim Ecol. 2018 Mar 30. doi: 10.1111/1365-2656.12831. Pellissier, L., Albouy, C., Bascompte, J, Farwig, N., Graham, C., Loreau, M., Maglianesi, M.A., Melian, C.J., Pitteloud, Tomas Roslin, Rudolf Rohr, Serguei Saavedra, Wilfried Thuiller, Woodward, C.G., Zimmermann, N.E. and Gravel, D. (2017): Comparing species interaction networks along environmental gradients. Biol. Rev. DOI: 10.1111/brv.12366 accepted 18 August 2017. Tiede, Y., Schlautmann, J., Donoso, D.A., Wallis, C.I.B., Bendix, J., Brandl, R., Farwig, N. (2017): Ants as indicators of environmental change and ecosystem processes. Ecol. Indic. Tiede, Y., Homeier, J., Cumbicus, N., Pena, J, Albrecht, J., Ziegenhagen, B., Bendix, J., Brandl, R., Farwig, N. (2016) Phylogenetic niche conservatism does not explain elevational patterns of species richness, phylodiversity and family age of tree assemblages in Andean rainforest. Erdkunde 70: 83-106. Peters F., D.G. Berens, G.R. Grieve & N. Farwig (2015) Forest fragmentation drives the loss of insectivorous birds and an associated increase in herbivory. Biotropica. Slik, F.J.W., V. Arroyo-Rodríguez, S.-I. Aiba, P. Alvarez-Loayz, P., […], N. Farwig, […], B.G. Luize, and E.M. Venticinq (2015) An estimate of the number of tropical tree species richness. Proceedings of the National Academy of Sciences 112:7472–7477. Botzat, A., L. Fischer & N. Farwig (2015) Regeneration potential in South African forest fragments: extinction debt paid off or hampered by contemporary matrix modification? Plant Ecology DOI 10.1007/s11258-015-0457-9. Grass, I., R. Brandl, A. Botzat, E.L. Neuschulz & N. Farwig (2015) Contrasting taxonomic and phylogenetic diversity responses to forest modifications: comparisons of taxa and successive plant life stages in South African scarp forest. 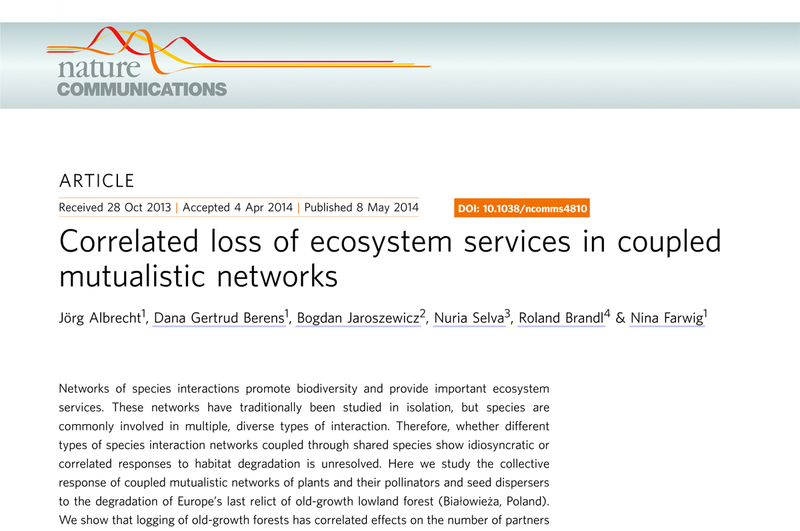 PLoS ONE DOI: 10.1371/journal.pone.0118722. Albrecht, J., V. Bohle, D.G. Berens, B. Jaroszewicz, N. Selva and N. Farwig (2015) Variation in neighbourhood context shapes frugivore-mediated facilitation and competition among co-dispersed plant species. Journal of Ecology 103:526-536. Schor, J., N. Farwig and D.G. Berens (2015) Intensive land-use and high native fruit availability reduce fruit removal of the invasive Solanum mauritianum in South Africa. South African Journal of Botany 96:6-12. Hudson, L.N., T. Newbold, S. Contu, S.LL. Hill, I. Lysenko, A. De Palma, H.R.P. Phillips, R.A. Senior, […], N. Farwig, […], J.P.W. Scharlemann and A. Purvis (2014) The PREDICTS database: a global database of how local terrestrial biodiversity responds to human impacts. Ecology and Evolution DOI: 10.1002/ece3.1303. Astudillo Webster, P.X., G.M. Samaniego, P.J. Machado, J.M. Aguilar, B.A. Tinoco, C.H. Graham, S.C. Latta and N. Farwig (2014) The impact of roads on the avifauna of páramo grasslands in Cajas National Park, Ecuador. 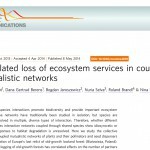 Studies on Neotropical Fauna and Environment doi:10.1080/01650521.2014.960778. Farwig, N., R. Brandl, S. Siemann, F. Wiener and J. Müller (2014) Decomposition rate of carrion is depedent on composition not abundance of the assemblages of insect scavengers. Oecologia doi:10.1007/s00442-014-2974-y. Farwig, N., T. Lung, G. Schaab and K. Böhning-Gaese (2014) Linking land use scenarios, remote sensing and monitoring to project impact of management decisions. Biotropica 46:357-366. Berens, D.G., L. Chama, J., Albrecht and N. Farwig (2014) High conservation value of forest fragments for plant and frugivore communities in a fragmented forest landscape in South Africa. Biotropica 46:350-356. Grass, I., D.G. Berens and N. Farwig (2014) Natural habitat loss and exotic plants reduce the functional diversity of flower visitors in a heterogeneous subtropical landscape. Functional Ecology doi:10.1111/1365-2435.12285. Peter, F., D.G. Berens and N. Farwig (2014) Effects of local tree diversity on herbivore communities diminish with increasing forest fragmentation on the landscape scale. PLoS ONE 9:e95551. Grass, I., D.G. Berens and N. Farwig (2014) Guild-specific shifts in visitation rates of frugivores with habitat loss and plant invasion. Oikos 123:575-582. Aparicio, A., D.G. Berens, J. Müller and N. Farwig (2013) Resources determine frugivore assemblages and fruit removal along an elevational gradient. Acta Oecologica 52:45-49. Grass, I., D.G. Berens, F. Peter and N. Farwig (2013) Additive effects of exotic plant abundance and land-use intensity on plant-pollinator interactions. Oecologia 173:913-923. Albrecht, J., D.G. Berens, N. Blüthgen, B. Jaroszewicz, N. Selva and N. Farwig (2013) Logging and forest edges reduce redundancy in plant-frugivore networks in an old-growth European forest. Journal of Ecology 101:990-999. Chama, L., D.G. Berens, C.T. Downs and N. Farwig (2013) Do frugivores enhance germination success of plant species? An experimental approach. South African Journal of Botany 88:23-27. Botzat, A., L. Fischer and N. Farwig (2013) Forest-fragment quality rather than matrix habitat shapes herbivory on tree recruits in South Africa. Journal of Tropical Ecology 29:111-122. Chama, L., D.G. Berens, C. Downs and N. Farwig (2013) Habitat characteristics of forest fragments determine specialisation of plant-frugivore networks in a mosaic forest landscape. PLoS ONE 8:e54956. Jeltsch, F., N. Blaum, U. Brose, J.D. Chipperfield, Y. Clough, N. Farwig, K. Geissler, C.H. Graham, V. Grimm, T. Hickler, A. Huth, F. May, K.M. Meyer, J. Pagel, B. Reineking, M.C. Rillig, K. Shea, F.M. Schurr, B. Schröder, K. Tielbörger, L. Weiss, K. Wiegand, T. Wiegand, C. Wirth and D. Zurell (2013) How can we bring together empiricists and modellers in functional biodiversity research? Basic and Applied Ecology14:93-101. Neuschulz, E.L., I. Grass, A. Botzat, S.D. Johnson and N. Farwig (2013) Persistence of flower visitors and pollination services of a generalist tree in modified forests. Austral Ecology 38:374-382. Neuschulz, E.L., M. Brown and N. Farwig (2013) Frequent bird movements across a highly fragmented landscape: the role of species traits and forest matrix. Animal Conservation 16:170-179. Laurance, W.F., D.C. Useche, J. Rendeiro, M. Kalka, C.J.A. Bradshaw, S.P. Sloan, S.G. Laurance, M. Campbell, […], N. Farwig, […], P. Yonzon and F. Zamzani (2012) Averting biodiversity collapse in tropical forest protected areas. Nature 489:290-294. Albrecht, J., E.L. Neuschulz and N. Farwig (2012) Impact of fruit abundance and habitat structure on fruit removal by avian seed dispersers and predators. Basic and Applied Ecology 13:347-354. Farwig, N. and D.G. Berens (2012) Imagine a world without seed dispersers: A review of threats, consequences and future directions. Basic and Applied Ecology 13:109-115. Lung, T., M.K. Peters, N. Farwig, K. Böhning-Gaese, and G. Schaab (2012) Combining long-term land-cover time series and field observations for spatially explicit predictions on changes in tropical forest biodiversity. International Journal of Remote Sensing 33:13-40. Schleuning, M., N. Farwig, M. K. Peters, T. Bergsdorf, B. Bleher, R. Brandl, H. Dalitz, G. Fischer, W. Freund, M.W. Gikungu, M. Hagen, F. Hita Garcia, G. H. Kagezi, M. Kaib, M. Kraemer, T. Lung, C.M. Naumann, G. Schaab, M. Templin, D. Uster, J.W. Wägele and K. Böhning-Gaese (2011) Forest fragmentation and selective logging have inconsistent effects on multiple animal-mediated ecosystem processes in a tropical forest. PLoS ONE 6:e27785. Otieno, N.E., N. Gichuki, N. Farwig and S. Kiboi (2011) The role of farm structure on bird assemblages around a Kenyan tropical rainforest. African Journal of Ecology 49:410-417. Neuschulz, E.L., A. Botzat, and N. Farwig (2011) Effects of forest modification on bird community composition and seed removal in a heterogeneous landscape in South Africa. Oikos 120:1371-1379. Voigt, F.A., N. Farwig, and S.D. Johnson (2011) Interactions between the invasive tree Melia azedarach (Meliaceae) and native frugivores in South Africa. Journal of Tropical Ecology 27:355–363. Kirika, J.M., K. Böhning-Gaese, B. Dumbo and N. Farwig (2010) Reduced abundance of late-successional trees but not of seedlings in heavily compared with lightly logged sites of three East African tropical forests. Journal of Tropical Ecology 26: 533-546. Farwig, N., N Sajita, and K. Böhning-Gaese (2009) Corrigendum to “Conservation value of forest plantations for bird communities in western Kenya” [Forest Ecol. Manag. 255 (2008) 3885-3892]. Forest Ecology and Management 258: 1731-1734. Farwig, N., D. Bailey, E. Bochud, J.D. Herrmann, E. Kindler, N. Reusser, C. Schüepp and M.H. 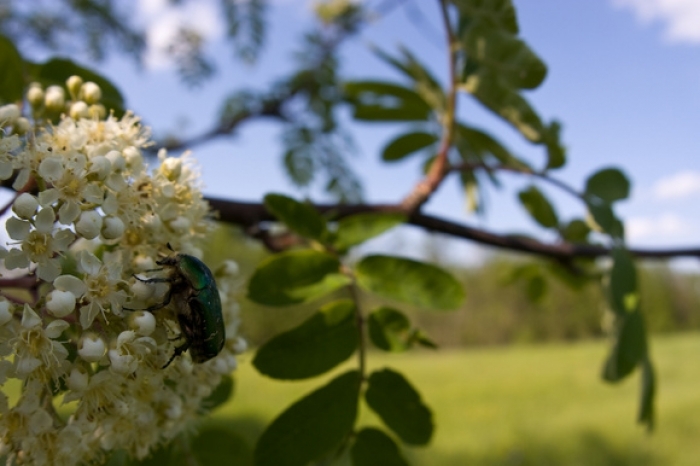 Schmidt-Entling (2009) Isolation from forest reduces pollination, seed predation and insect scavenging in Swiss farmland. Landscape Ecology 24: 919-927. Voigt, F.A., R. Arafeh, N. Farwig, E.M. Griebeler and K. Böhning-Gaese (2009) Linking seed dispersal and genetic structure of trees: a biogeographical approach. Journal of Biogeography 36: 242-254. Farwig, N., N. Sajita, and K. Böhning-Gaese (2009) High seedling recruitment of indigenous tree species in forest plantations in Kakamega Forest, western Kenya. Forest Ecology and Management 257: 143-150. Farwig, N., N. Sajita, and K. Böhning-Gaese (2008) Conservation value of forest plantations for bird communities in western Kenya. Forest Ecology and Management 255: 3885-3892. Kirika, J.M., B. Bleher, K. Böhning-Gaese, R. Chira and N. Farwig (2008) Fragmentation and local disturbance of forests reduce frugivore diversity and fruit removal in Ficus thonningii. Basic and Applied Ecology9: 663-672. Kirika, J.M., N. Farwig, and K. Böhning-Gaese (2008) Effects of local disturbance of tropical forests frugivores and seed removal of a small-seeded Afrotropical tree. Conservation Biology 22: 318-328. Farwig, N., B. Bleher, S. v.d. Gönna and K. Böhning-Gaese (2008) Does forest fragmentation and selective logging affect seed predators and seed predation rates of Prunus africana (Rosaceae)? Biotropica 40: 218-224. Farwig, N., N. Sajita, G. Schaab and K. Böhning-Gaese (2008) Human impact diminishes seedling species richness in Kakamega Forest, Kenya. Basic and Applied Ecology 9: 383-391. Farwig, N., C. Braun and K. Böhning-Gaese (2008) Human disturbance reduces genetic diversity of an endangered tropical tree, Prunus africana (Rosaceae). Conservation Genetics 9: 317-321. Berens, D.G., N. Farwig, G. Schaab and K. Böhning-Gaese (2008) Exotic guavas are foci of forest regerneration in Kenyan farmland. Biotropica 40: 104-112. Farwig, N., K. Böhning-Gaese and B. Bleher (2006) Enhanced seed dispersal of Prunus africana in fragmented and disturbed forests? Oecologia 147: 238-252. Voigt, F.A., S. Jung, N. Farwig and K. Böhning-Gaese (2005) Low fruit set in a dioecious tree: pollination ecology of Commiphora harveyi in South Africa. Journal of Tropical Ecology 21: 179-188. Farwig, N., E.F. Randrianirina, F.A. Voigt, M. Kraemer and K. Böhning-Gaese (2004) Pollination ecology of the dioecious tree Commiphora guillauminii (Burseraceae) in Madagascar. Journal of Tropical Ecology 20: 307-316. Farwig, N. (2011) Book Review: Ghazoul, J, D. Sheil (Eds.) Tropical Rain Forest Ecology, Diversity and Conservation. Basic and Applied Ecology 12:477-478. Farwig, N. (2009) Book Review: Beck, E., J. Bendix, I. Kottke, F. Makeschin, R. Mosandl (Eds.) Gradients in a Tropical Mountain Ecosystem of Ecuador. Basic and Applied Ecology 10: 293. Farwig, N. (2008) Book Review: Tscharntke, T., C. Leuschner, M. Zeller, E. Guhardja, A. Bidin (Eds.) Stability of Tropical Rainforest Margins – Linking Ecological, Economic and Social Contraints of Land Use and Conservation. Basic and Applied Ecology 9: 189. Farwig, N. and K. Böhning-Gaese (2008) Biologische Vielfalt in Ostafrika: Folgen von Landnutzung und Klimawandel. Natur & Geist (Forschungsmagazin der Johannes Gutenberg-Universität Mainz): 70-73.